used entry without repayment We ask all Swiss and foreign exhibitors to respect the prescriptions as imposed by the veterinary surgeon and explained in the programme. Exhibitors who do not follow these regula tions will be refof the entry fee! In Switzerland it is forbidden for docked dogs or dogs with cropped ears to be shown. There will be no refund of entry fees. 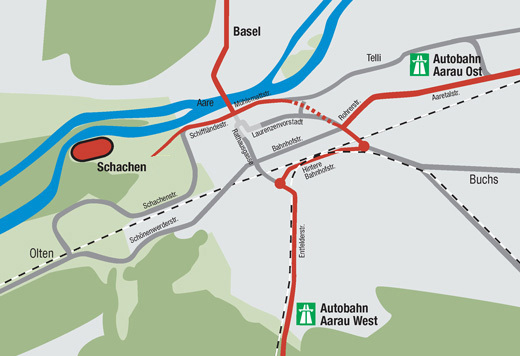 Take the A1 direction Bern and leave at the exit “Aarau-Ost”. Turn right and stay in the right lane. This road takes you onto the Aaretalstreet (5) direction Suhr – Aarau (green sign). Leave this road after 5 kilometres (white sign “Telli / Schachen). Stay in the right lane and turn right at the traffic lights. (Transit). Take the second exit at the first roundabout. You are now on the Tellistreet. There are two more roundabouts. Keep following the Tellistreet (always straight). This road changes it’s name first into Műhlemattstreet and then into Schiffländestreet. You are now driving parallel to the Aare. Keep going straight. Follow the signs for Schachen. After around 300 metres and a 90 degrees left bend, you’ll arrive at the big car park on the Schachenmeadow. Take the A1 direction Zűrich. Take the exit “Aarau-West” und turn afterwards right direction Aarau. You are now on the Suhrentalstreet (24). Once you arrive in Aarau, keep going straight. At the Turbinen roundabout (the AEW high rise building is on your left) take the first exit. You are now on the Hinteren Bahnhofstreet. At the next roundabout (Gaiskreisel) leave the traffic at the third exit direction Basel. Schachen is also mentioned on the sign. After the Sauerländertunnel you are now on the Műhlemattstreet. Stay on this road, which later on changes its name into Schiffländestreet. You are now driving parallel to the Aare. Keep going straight. Follow the signs for Schachen. After 300 metres and a 90 degrees left bend you will arrive at the big car park on the Schachenmeadow. 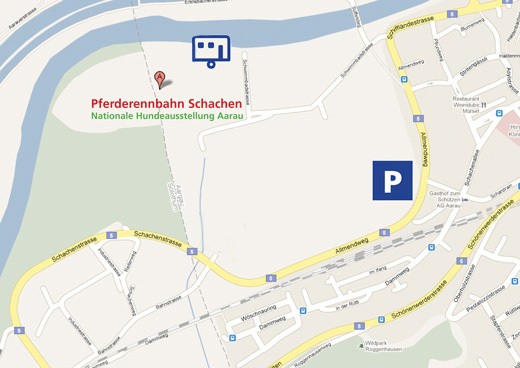 Take the number 6 bus from the station in Aarau direction Wőschnauring and leave the bus at the Allmendweg stop. There are plenty of parking spaces available on the Schachenmeadow. The fee per day and car (for cars arriving before 9.30am) is Fr. 7.00 (Euro 6.50). After 9.30am the fee will be double. The fee for motor homes is Fr.14.00 (Euro 13.00) per day. The separate parking place (no electricity or water connection) can be found around 500 metres away but still in Schachenstreet.